New York Magazine ran this great article on five monochromatic-dressing New Yorkers yesterday- visit here. The article was written by Joanna Goddard - an editor and the blogger behind A Cup of Jo. Its quite interesting how these things come about. 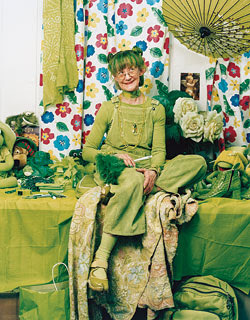 I was immediately struck by Mrs. Sweetheart ensconced in green as I think that could one day very easily be me. Its a slippery slope. Not that she isn't fabulous- but I look terrible in green and I'm asking now for someone to kindly intervene.